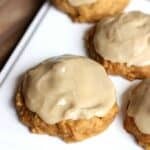 The most amazing Pumpkin Cookies with Caramel Frosting that will melt in your mouth! If I could only choose one cookie to bake this fall, this would be it! These delicious cookies are a spin-off of my (previous) all time favorite Pumpkin Chocolate Chip Cookies. 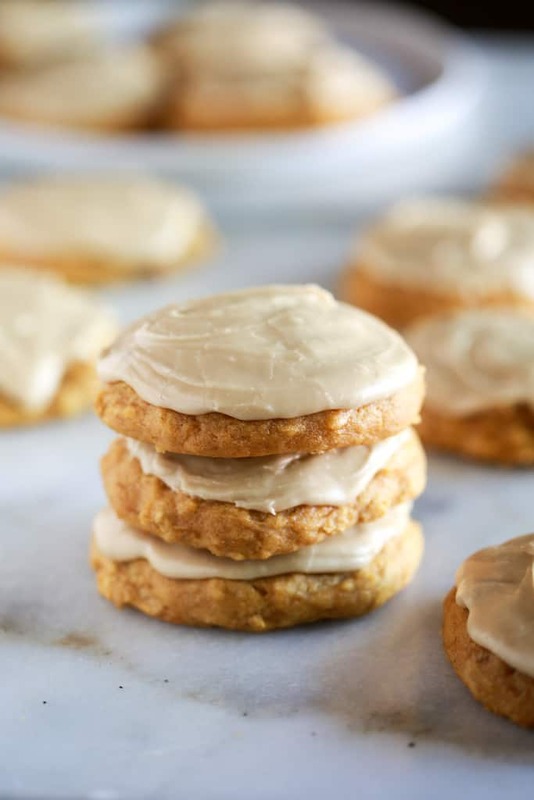 Pumpkin Chocolate Chippers have not just been my favorite “Fall” cookies, they’ve always been my favorite ALL-TIME cookies….until I made this version with the caramel frosting. WOW. These cookies are seriously amazing. After I snuck a taste tester I couldn’t wait for Jeff to get home to try them because I knew he’d love them SOO much. 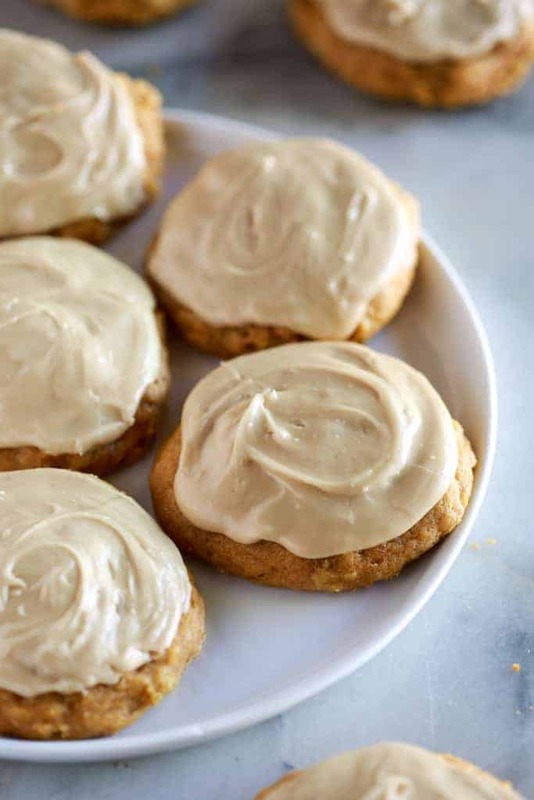 The real magic is in the caramel frosting, which may sound complicated but is SO easy to make. 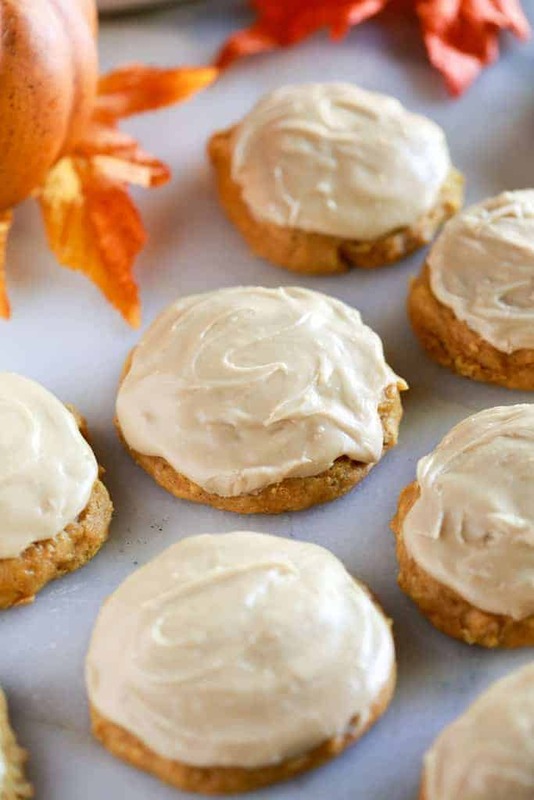 The frosting makes these pumpkin cookies melt in your mouth! I don’t suggest storing pumpkin cookies at room temperature because the oil and canned pumpkin in them will cause them to “sweat”. They will still taste delicious, but the tops of them will get sticky. I’ve found the best way to store them is freezing them, after frosting them. You wont believe how amazingly fresh they taste when you let them come to room temperature (or stick one in the microwave for a few seconds if you’re impatient, like me). *I first shared this recipe August 2014. Updated October 2018. Wow these look perfect. That caramel frosting sounds amazing! Thanks Aimee, The caramel frosting is to die for! If you don’t have heavy cream can you use something else? H Nancy, you could use evaporated milk as a substitute! Wonder if gluten free flour would work??? What size can of pumpkin for that yummy sounding cookie recipe, please. Hi Joan, if you buy a 15oz can of pumpkin you will end up using about half of the can to get 1 cup. You can use 1/2 of a 16 oz. can OR double the recipe and use it all. These are amazing…I should’ve taken your advice and doubled the recipe! Oh my. That caramel frosting sounds fabulous! These look like a perfect fall treat. Can’t wait to give them a try! They are so perfect for fall! Hope you get a chance to make them soon! If I put choc cops in these, will I need to alert the recipe or baking time? No you can add chocolate chips and keep everything the same–same baking time etc! You’re amazing! I’m getting fat just looking at these! Haha Thanks Courtney 🙂 You’ve gotta try them! Love the frosting! Yay for fall pumpkin recipes! Thanks Amber! Bring on fall baking! What kind of flour do you use? Is it plain flour? Hi Kayann, what a perfect birthday treat! You can use skim milk, but if you use sea salt you’ll only want to add half as much as the recipe calls for. Let me know how you like them! I have everything I need for these, so I’m making them today. I have a caramel loving husband who will probably love them. Thank you for sharing your recipe. That’s awesome Leslie! Let me know how you like them! Laura, I love pumpkin recipes, but I am Lactose Intolerant so I always try to sub out coconut milk (all fat or low-fat) for heavy cream. I make whipped cream this way successfully. Silly that I married a Cheesehead, too. I know he would love this recipe and he does not mind me subbing dairy out so that I won’t get sick. 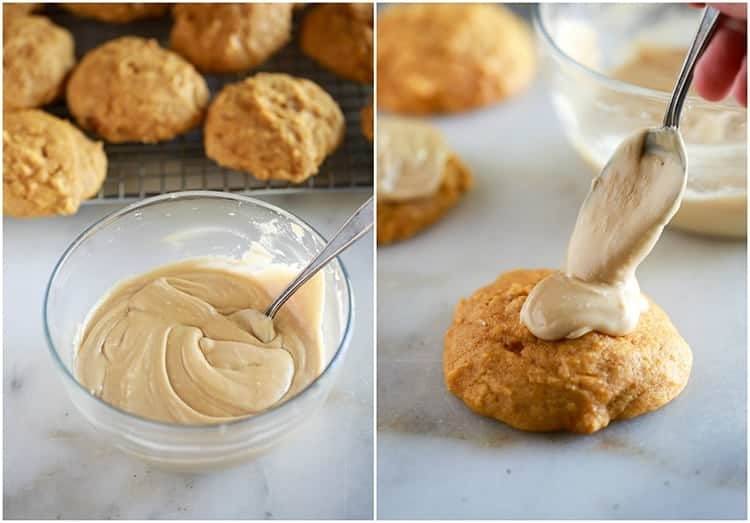 Any ideas or have you heard someone successfully making these pumpkin cookies and the caramel frosting dairy-free? Thanks for sharing. Hi Caroline, I haven’t tried any dairy-free substitutions, but I don’t see what coconut milk wouldn’t work! Let me know if you try it and how you like it! I have never made a cookie with oil…usually butter? could you sub butter? why oil? does this make them more cake like…? Does it matter if you use light or dark brown sugar? You say light? What do you consider heavy cream?Is it whipping cream?